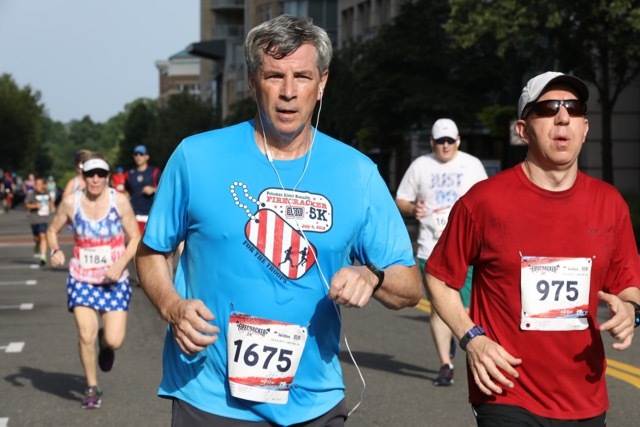 It felt odd to get up on a Tuesday morning for a race, but it was Independence Day and I had a tradition to uphold – running in the eighth annual =PR= Races Firecracker 5K For The Troops hosted by Potomac River Running and Leidos. 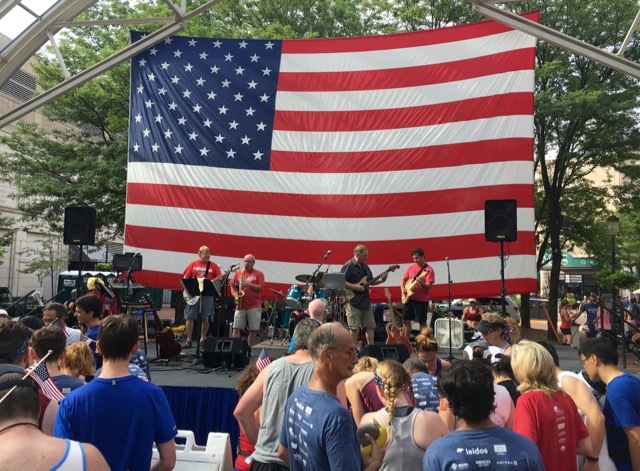 It was my fifth consecutive time running in what has become one of my very favorite races, and the perfect way to kick off the Fourth of July while supporting local military members and their families. As with the last several races, my friend Erin was kind enough to pick up my race packet while picking up hers and some of her friends’ packets. This year’s shirt is a poly-cotton blend and I love it! 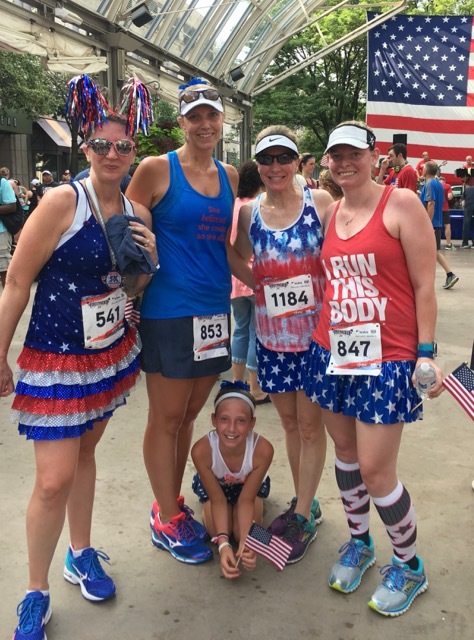 Some of my friends, who opted for the $10 gift card to Potomac River Running Store in lieu of getting a race shirt, cashed in their cards for a shirt after seeing how cute the shirt was for this year’s race. Once we’d parked in our favorite parking garage, we hit the construction porta potties and made our way to the race finish area to find our friends. 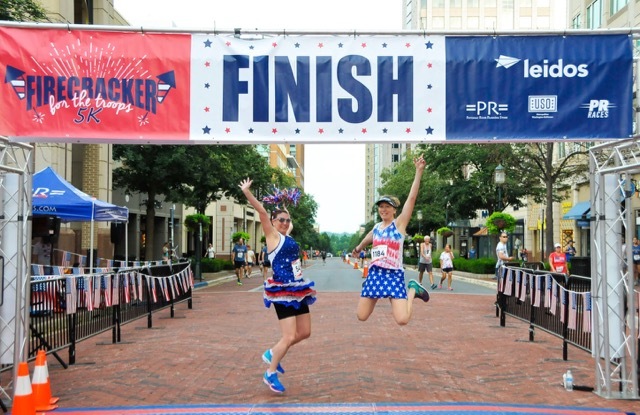 A race photographer happened to be looking for fun things to capture so we asked her to take a jumping picture of the two of us. We crouched down for takeoff, counted to three, and jumped – just not in a synchronized fashion. After finding a few of our friends and chatting for a few minutes, I decided to head out for a one-mile warmup run in the hopes of getting things moving along a little faster so I could hopefully make another porta potty stop before the race. My stomach/GI tract had felt off all morning and I joking told Erin that my only race goal was to not poop my pants. TMI? Just keeping it real since GI issues seem to be a common problem for us runners. 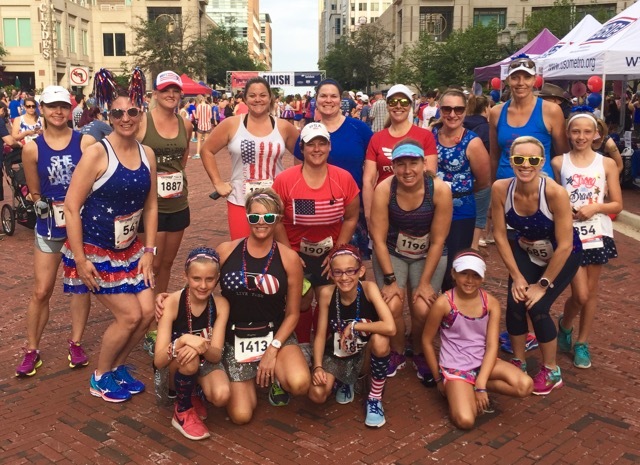 While I was either out on my warm-up run or in the bathroom line, my MRTT chapter met for a pre-race picture. I was sad to miss it, but I had priorities I needed to focus on! 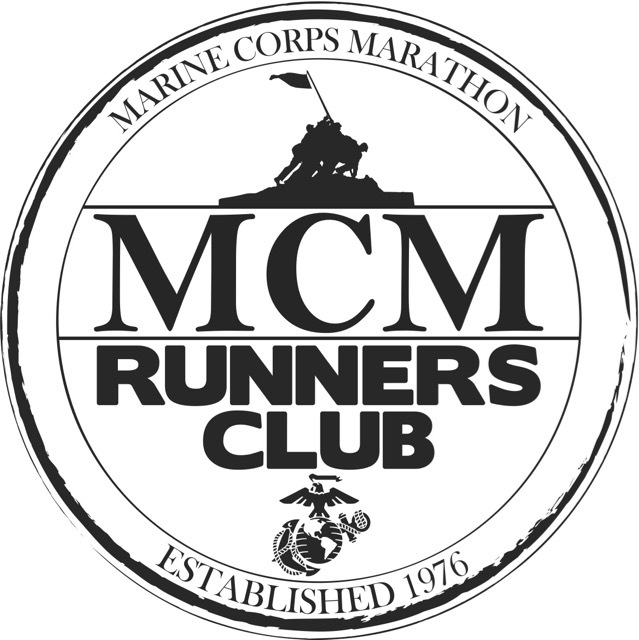 Still not feeling right, I headed to the starting line and self-seeded in the 9:00 to 10:00 pace area. 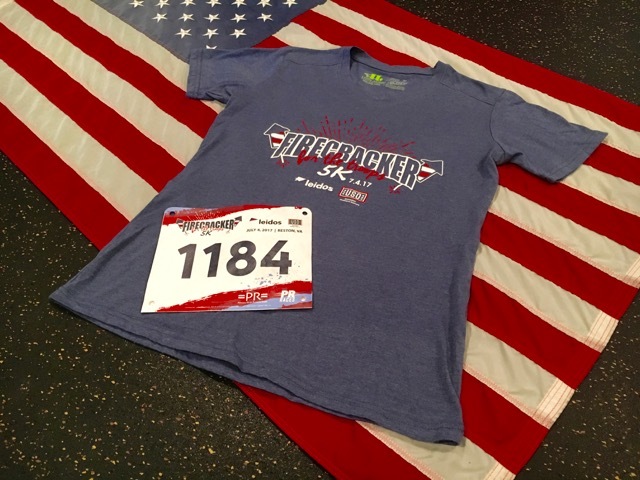 For the past four Firecracker 5K’s, my average pace has ranged between 7:50 and 8:21, but I knew that after two injuries and zero speed work this year, I’d be lucky to maintain a 9:00 average pace and anything faster would be a gift. Just as I approached the starting area, the announcer told us to look up to the top of the parking garage and wave to the photographer. After waving, I turned to step into my starting corral and heard my name called. There, right behind me, was my friend Kim and her daughter. We chatted for the few remaining minutes before the race started and decided to take a quick picture which was easier said than done. I already had my music set up so my phone was on a leash and refused to be held very far away from my body. 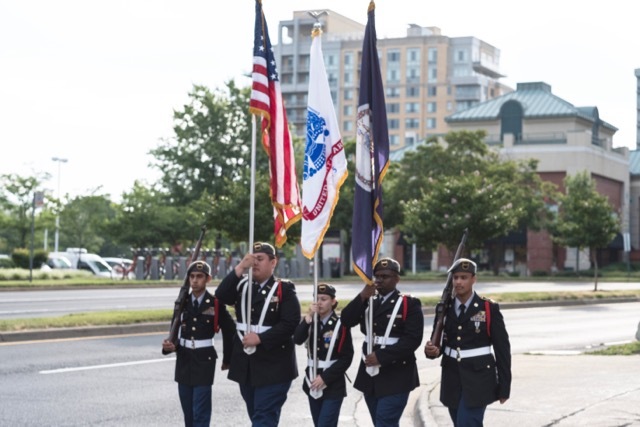 A local high school Army ROTC carried out the American, Virginia, and Army flags – I think that’s called the showing of the colors. 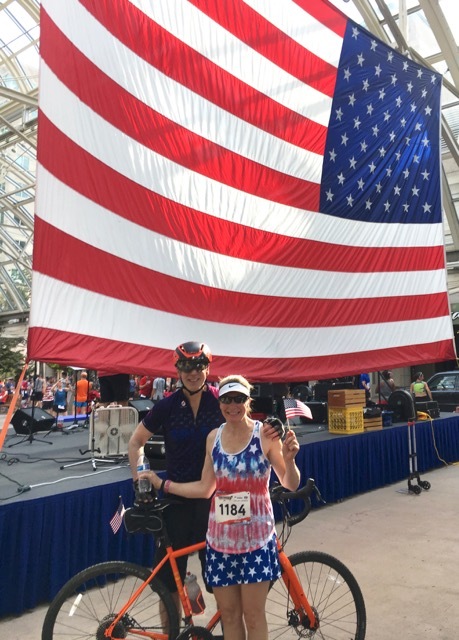 Without a singer or recorded music, we runners sang our National Anthem on a beautiful Independence Day morning. After saying she’d see us in just over three miles and wishing us a great race, the announcer did a three-two-one count down, and we were off! Bill had told me that he’d ride his bike over to the race course to cheer me on and for me to be sure to start my Glympse app and share my location with him so he’d know where I was on the course. I watched for him from the time we started, and was thrilled to find him on the back side of the course. My friend Susan from Skirts and Socks shouted to Bill as she ran past and he got a couple of great pictures of her as well. Bill was also on the final corner where we turned onto Fountain Drive to head up the hill to the finish line, but I surprised him and he didn’t get a picture. He did get some great pictures of some of our friends, though. 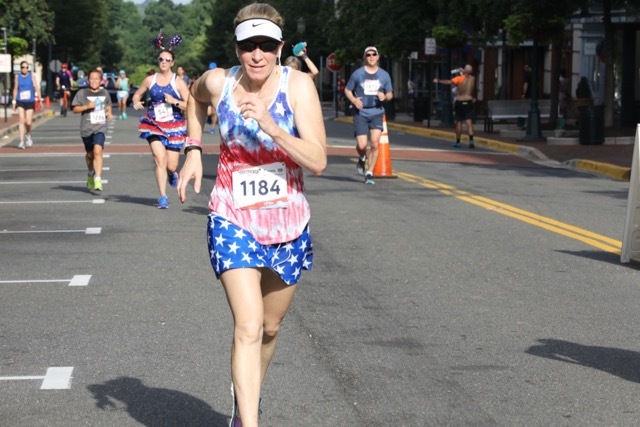 I crossed the finish line with a time of 27:29 (8:52 pace) which gave me a 7th place out of 54 women in my age group, and my slowest Firecracker 5K. 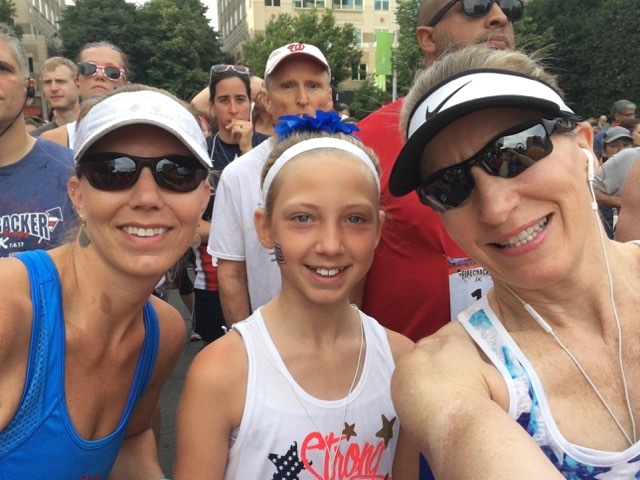 I was thrilled to meet both of my race goals – finish the race without having to make an emergency potty stop and to run somewhere near a 9:00 average pace. 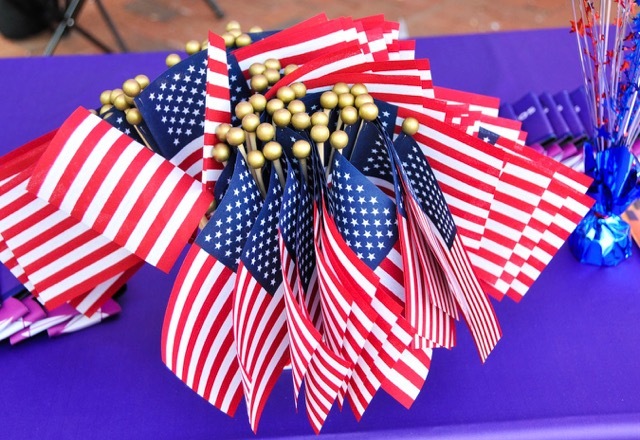 As I crossed the finish line I was handed a small American flag which I later gave to Bill for the back of his bike. Finished, Erin and I found each other immediately and headed off in search of food and our friends. I grabbed a water bottle and a chocolate chip cookie and got melted chocolate all over my fingers. I guess that’s what you get for eating a cookie at 8:45 AM, even if it is a holiday. We found our friends, chatted a while, and then I went in search of Bill to say goodbye so he could finish his 40-mile bike ride. Erin found a race costume twin and after comparing fashion notes, they happily posed for a picture. 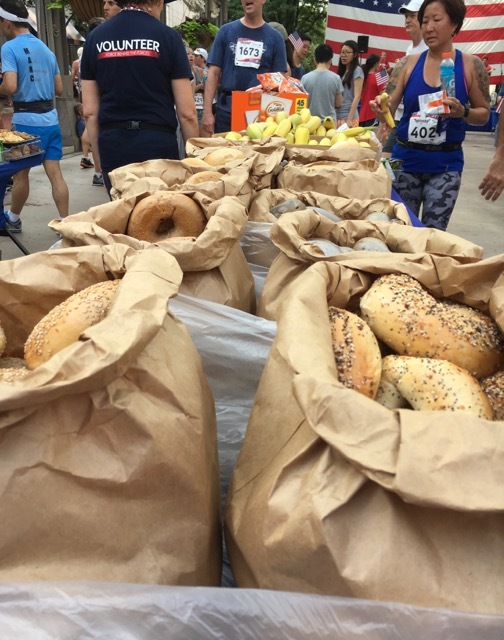 We had a little trouble finding the race results because they’d been moved from where they’re usually hung – how dare anyone change anything on this creature of habit! 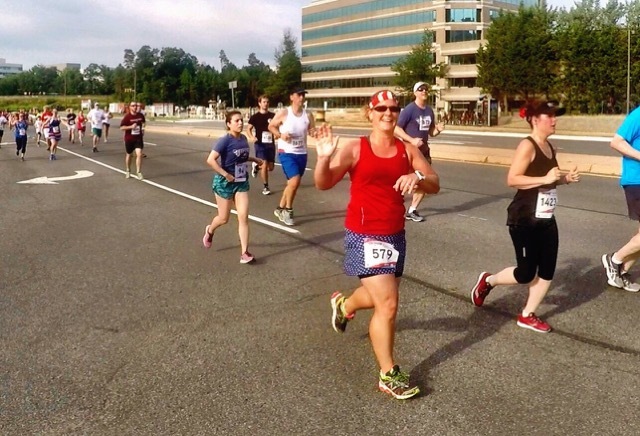 Once we made our way to the front of the table and got our results, we headed to the parking garage to drive home while rehashing yet another fantastic Firecracker 5K. 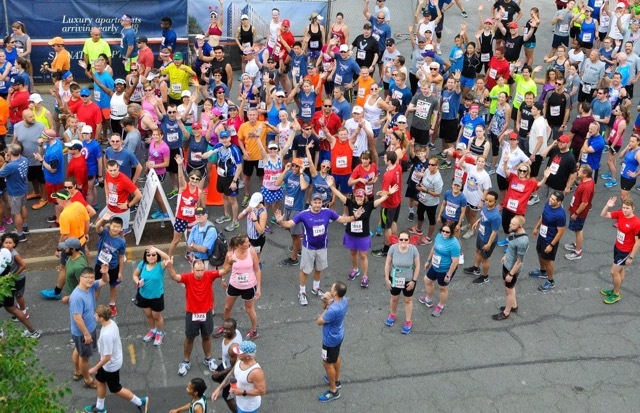 If you live in the DC/MD/NOVA area and are looking for a fun way to start your Independence Day with a bang, join me in running this great race next year. =PR= Races never disappoints! 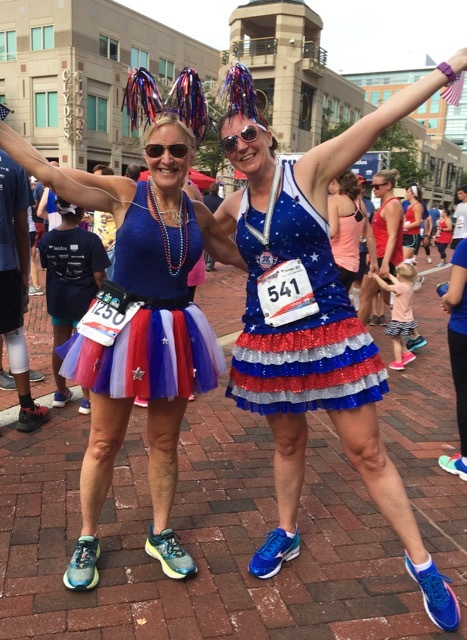 Running skirts – yay or nay? If yay, sparkle or tutu? 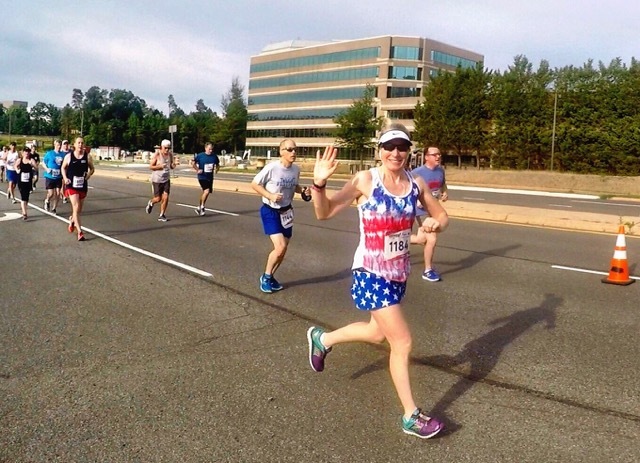 Do you wear costumes or theme colors for races? 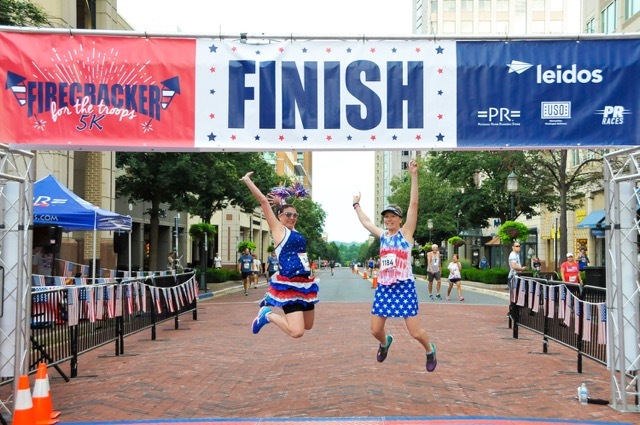 Did you race on Independence Day? 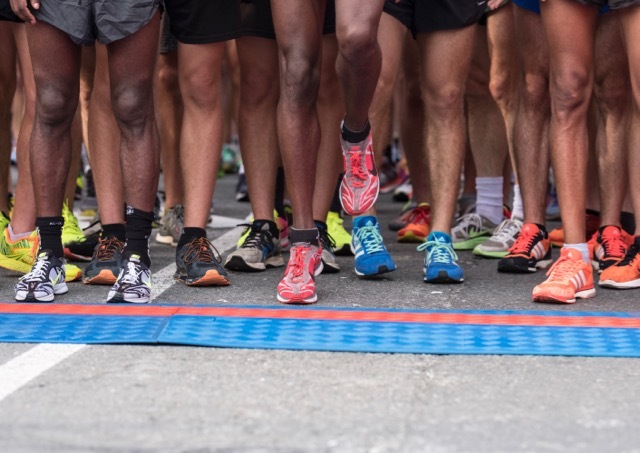 Flying Deer, Rabid Animals; And What’s The Difference Between A Runner And A Jogger? Great job! Sounds like a fun race and the shirt is cute (you never know what to expect). I have a few basic running skirts, nothing frilly. 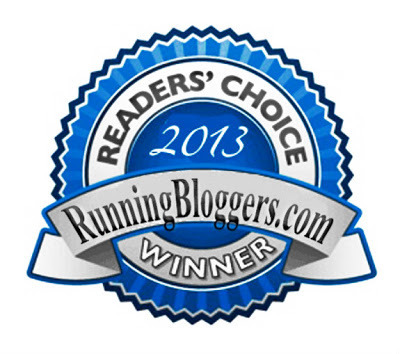 I ran a 10k in one years ago, but I prefer shorts! That’s funny, I also check the results of random people that I passed or passed me! I find the extra layer that a running skirt has just makes me hotter! 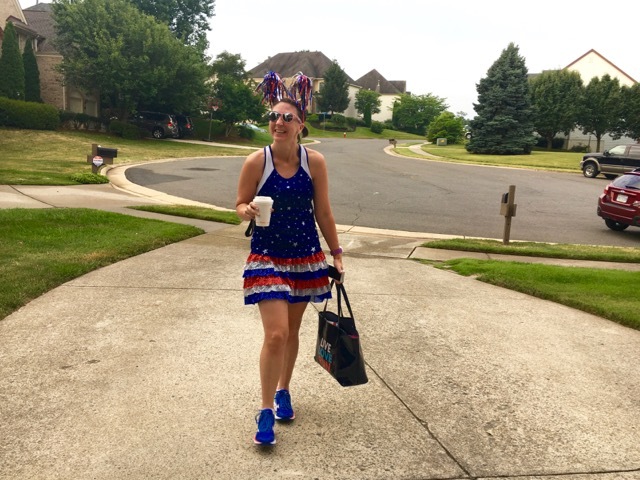 Sadly, no racing for me this year on Independence Day, but I ALWAYS dress for the occasion LOL I’m kind of getting away from running skirts, but do wear them once in awhile. And tutus? Been there, done that a few times 😉 Your outfit looks great! This event sounds like a winner! 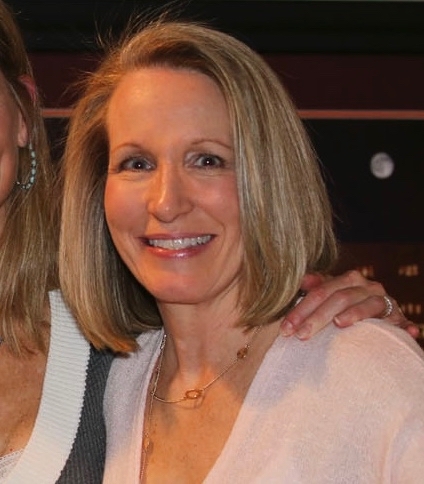 Kimberly Hatting recently posted…Have You Thanked a Healthcare Professional Lately? Well done. It was hot that morning! This looks like a well organized and fun race! I think it’s great that there was an option for a gift card or t-shirt, more races should do that! I love that your friend Erin really got into the spirit for the race! All of the =PR= Races have the gift card or shirt option. Isn’t it a fantastic idea? I love all the festive costumes! I’ve only ever wore sparkly skirts at Disney races and then I think I wore a red sparkly skirt one time for a Christmas themed race. Never wore a tutu. I love how all the runners sang the national anthem. It surprises me that there was no music or singer, was that intentional? Good job on meeting your goals. =PR= Races always (at least at all of their races I’ve run) has either someone sing the National Anthem or they play a recorded version. Perhaps something went wrong on race morning and that’s why we runners sang it unaccompanied by music. We do have a local 4 miler and I would dress up if I ran it but I usually opt out for a day on the lake. Congrats on a great race. Your speed will be back in no time. Independence Day spent on the lake sounds pretty fabulous to me! I use to love skirts but i am picking them up less and less lately. I love all the fun patriotic costumes!!!! There were some great costumes that’s for sure!